A man has been jailed for carrying out a string of cyber attacks against high-profile websites, resulting in more than 300 being taken offline. Sites affected included the Conservative Party, Wirral Council and Merseyside Police, the court heard. 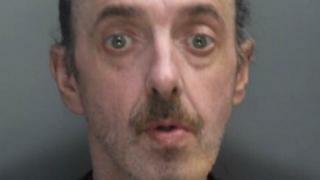 Ian Sullivan, 51, from Bootle, Merseyside, deprived vulnerable people of important information, police said. He was jailed for 34 weeks at Liverpool Crown Court after admitting the attacks at a previous hearing. In February, he admitted 21 counts of an unauthorised or reckless act with intent to impair computer operations. Other websites attacked included The Metropolitan Police, CafCass (Children & Family Court Advisory & Support Service), British Airways and several foreign sites. Judge Graham Morrow QC said Sullivan used a computer to mount "denial of service" attacks on public and business websites. The Crown Prosecution Service said he alerted the sites the websites with a tweet from Twitter account 'anonian01'. His tweets often included the words, "This is just the start! Tango down. It's not just you." Ben Southam, District Crown Prosecutor with Mersey-Cheshire Crown Prosecution Service's Complex Casework Unit, said: "Sullivan launched a series of malicious attacks on important websites that caused considerable distress and inconvenience to often vulnerable clients. "He was motivated by anger and no doubt thought that he was too clever to be caught. He was wrong."